CHASING FOOD DREAMS: Paya Serai Restaurant, Hilton Petaling Jaya: A Merry Gastronomic Barbeque Feast! Paya Serai Restaurant, Hilton Petaling Jaya: A Merry Gastronomic Barbeque Feast! More merriment is just around the corner with the coming festive holidays! 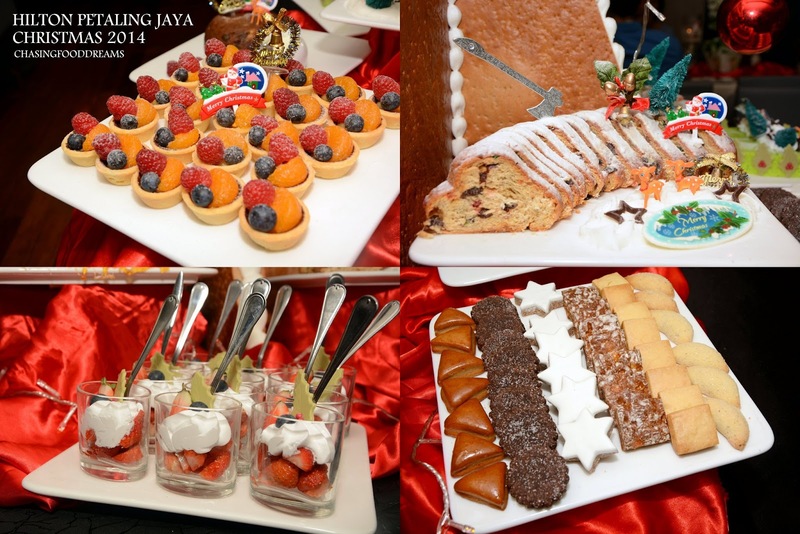 Joining in the holiday cheer, Hilton Petaling Jaya is taking everyone on a merry gastronomic journey where the hotel’s master chefs present a Barbeque Feast in their Christmas Eve Buffet Dinner and Christmas Day High Tea at Paya Serai Restaurant. Be dazzled, be tempted and indulgence in the mouth-watering dining experience at all the restaurants in the hotel. We visited Paya Serai recently for a glimpse of their glorious festive feast and were totally smitten with the spread of holiday dishes, both savory and sweet. 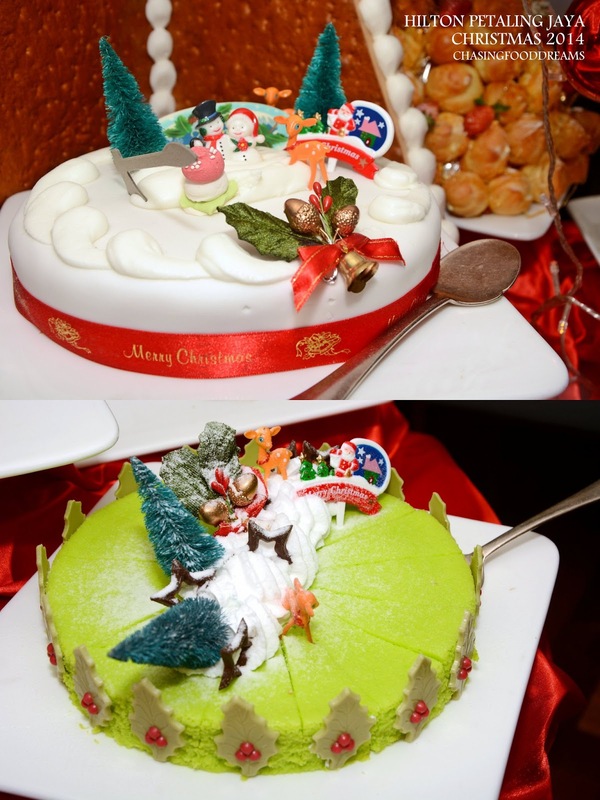 Upon entrance, a Christmas tree made from gingerbread cookie already won many hearts with its majestic presence. Standing proud and tall, it is also the backdrop for the awesome spread of holiday feast to come. Paya Serai Restaurant beautifully chic interior combines mother pearl with metallic and silver shades throughout the restaurant. The dining area is also cleverly sectioned off to offer guests more privacy. Private dining room is also available. The main buffet area shows off open kitchen set in a dramatic dining backdrop. Spacious and lighted with a soft glow, the restaurant is elegant and yet comfortable. A must in every Christmas meal, Roasted Tom Turkey with its usual entourage of Chestnut & Sage Stuffing, Brussel Sprouts, Giblet Gravy, Cranberry-Orange Compote, Beet Chutney and Cranberry-Mustard Relish. Another signature of the restaurant is Garlic Marinated Roasted Leg of Lamb and Roasted Venison with its own team of sides of Baked Potatoes, Yorkshire Pudding, Corn in Butter, French Beans with Mushrooms & Pinenuts, Honey Glazed Carrot and a whole lot of various gravy. The spread for this alone is utterly scrumptious, setting the holiday mood with much satiation. 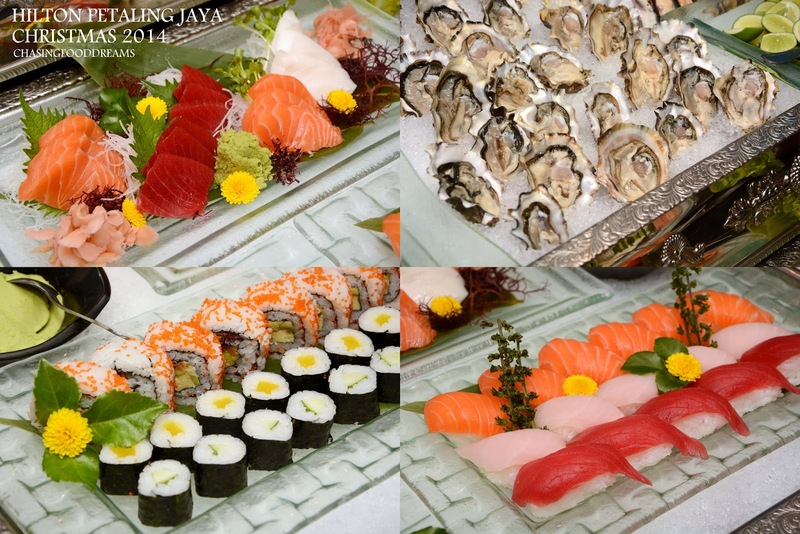 Start the merry feast with favorites of the freshest cut of Sushi and Sashimi, Fresh Shucked Oyster, Chilled Prawns and an array of appetizers. For the ‘love of shuck’, the list of more appetizers has Oysters with Cucumber Jelly, Tomato Shooters and Green Papaya Relish and more. Warm up to a selection of soups and bisque with specials like Pumpkin Soup and more! 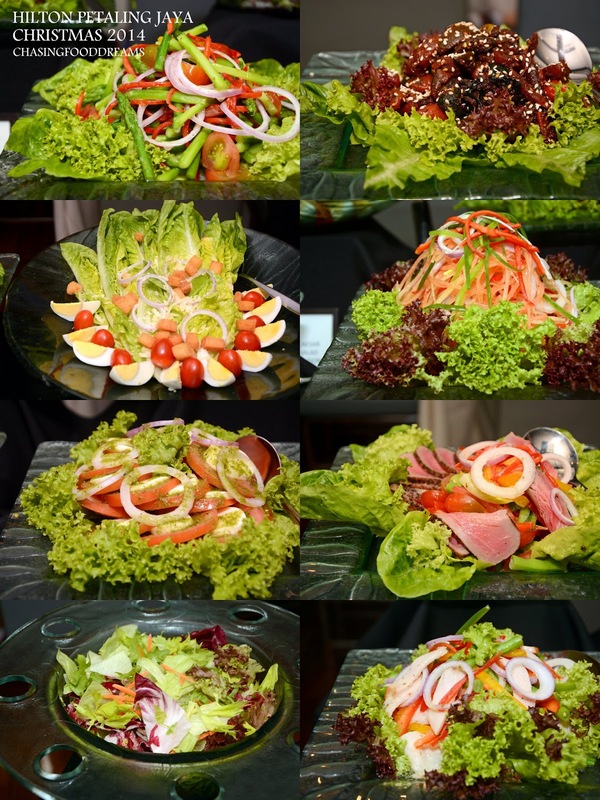 Salad Bar is very decent and has quite a variety of salads to make sure one eats more greens while indulging. 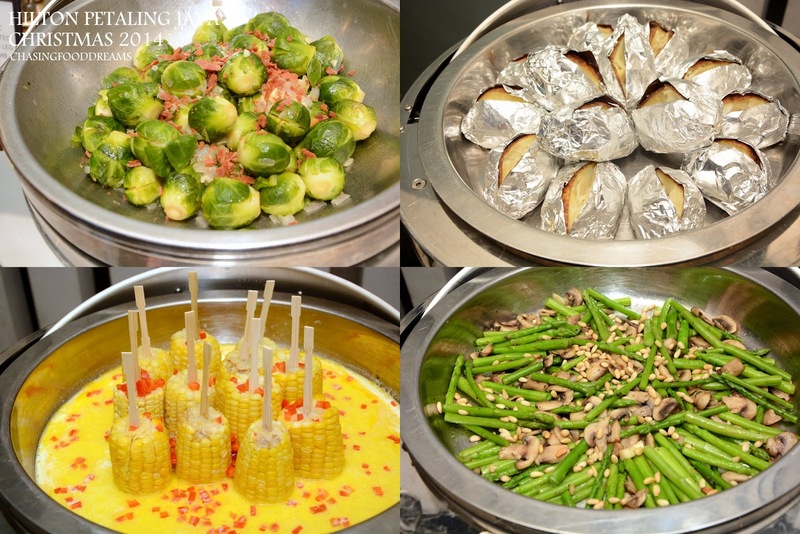 Executive Chef Ridzuan Malek made sure the Hot Buffet Station is filled with more healthy options such as barbequing, grilling and poaching. The spread includes Grilled Veal with Mushroom Ragout and Percik Sauce, Breaded Turkey Steak with Grilled Peaches & Pineapple, Poached Salmon Fillet with Nectarine Peanut Salsa, Tiger Prawn, Grilled Spring Chicken with Fruit BBQ Sauce, Poached Salmon with Leek Stew and Teriyaki Sauce and a whole lot more international and local dishes. It may be hard but festive feast always includes amazing festive dessert and sweets, so save some room for heavenly Croquembouche, Christmas Yule Log, Minced Pies, Christmas Fruit Cake, Christmas Stollen, Christmas Pudding, Assorted French Pastries, Miniature Fruit Savarin with Ginger, Cinnamon Almond Chocolate Cake, Poached Pear with Ginger Bread Spice, Christmas Cookies and the delicious list goes on… make sure to savor that magnificent Croquembouche of caramelized puff filled with luscious custard! A magical feast awaits at Paya Serai Restaurant at Hilton Petaling Jaya this festive holiday for family and friends gathering to reign in the holiday cheer! To get into the spirit of Christmas, an Advent calendar complete with Christmas socks is buid to countdown and celebrates the days in anticipation of Christmas. Diners who spend RM150 in a single receipt would win daily ‘mystery gifts’ which consists of Christmas treats and goodies.